People with asthma and mold allergies are the first to ask about mold testing. Since their symptoms are primarily respiratory, it is only logical they ask for “air quality testing.” Other individuals looking for peace of mind or suffering much more severe symptoms sometimes also ask for mold testing air quality services. This blog is about air quality testing and some of the variables and limitations that should be considered in every mold testing job. 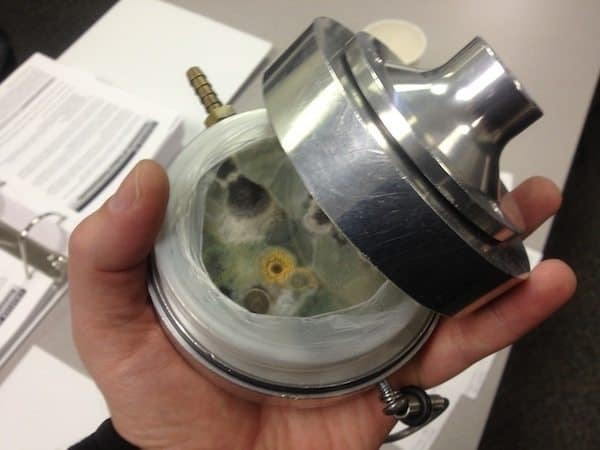 Part of our job is to help develop a mold testing air quality sampling plan specific to your project, and to help interpret the lab results in light of discoveries made during the visual inspection. I’ve heard mold testing described as “an art and a science,” and I agree with that sentiment. Since it’s not a federally regulated contaminant it has been a little bit of the wild west in terms of who tests, what they test for, and how the results are interpreted. For a customer – that should scare you! – because it has meant that anyone could call themselves mold inspectors without having adequate training or professional credentials to demonstrate their competence. Mold Testing – When to Test Air Quality? Most experts, including the EPA and California Department of Public Health, suggest only testing under very specific conditions. In general, a moisture and mold inspection by a qualified professional is far more useful in determining if a mold problem exists. However, there are some circumstances that warrant additional air quality testing. The most commonly referred to guidance for how to perform mold inspections and when/how to test for mold is the AIHA “Green Book,” Recognition, Evaluation and Control of Indoor Mold. 1) Determining the scope of contamination. 2) Determine the type of contamination. Mold Testing – What Type of Air Quality Testing Method? Surface samples: sampling the amount of mold spores deposited on indoor surfaces (tape, and dust samples). Dr. Ritchie Shoemaker, MD is a strong believer in dust sampling using the Environmental Relative Moldiness Index (ERMI). Spore trap non-viable (non-culturable) sampling. 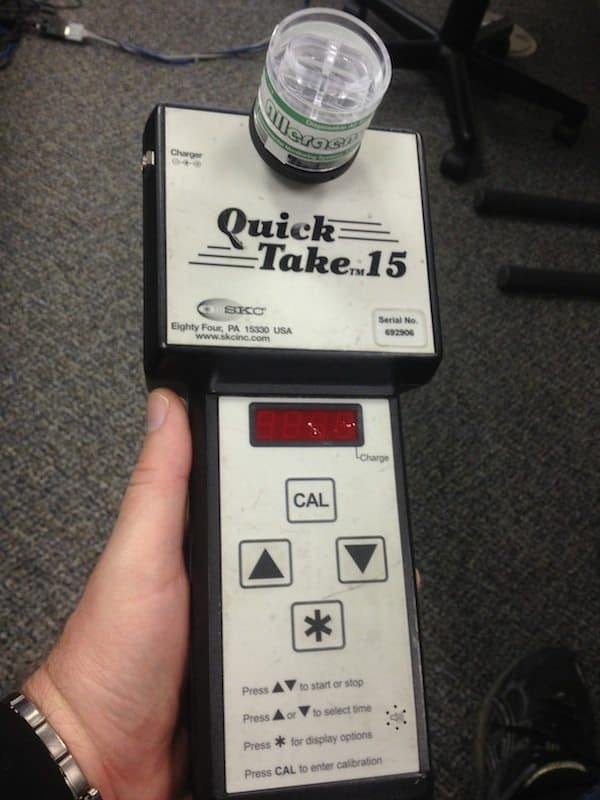 While controversial, this is the most common type of “mold testing” we see performed in the industry. A calibrated pump draws a known volume of air over a greased slide. This is an “impaction” method of collecting spores. Based on a direct microscopic examination of a portion of the slide, the lab extrapolates how many spores are present per cubic meter, and can identify many common genera of mold. One weakness of direct visual examination is that some common genera, such as Penicillium and Aspergillus, cannot be differentiated and reported cumulatively. Another obvious weakness is that heavier spores, such as Stachybotrys, may be present but not aerosolized and therefore underreported if only air sampling is performed. Pitri Dish-style, viable (culturable) sampling. The second most common type of air sampling for mold is also an impaction-style collector. A petri dish with a growing media is placed beneath a pin-holed cap and air is drawn over the petri-dish. The petri-dish is then incubated and visually inspected so the number of colony forming units (CFUs) of different types of molds are identified and counted. Common types of mold growth media are Malt Extract Agar (MEA), Potato Dextrose Agar (PDA), and Hay Infusion Agar. A strength of this method is that molds can be especiated. So in addition to differentiating between genera like Penicillium and Aspergillus, using viable (culturable) analysis you can identify if the mold is Aspergillus niger, or Penicillium marneffei. This can be valuable information since there are hundreds of species within each genera, and some are more toxigenic than others. Some weakness of this sampling method include the fact that different molds prefer different growth media, temperatures and moisture levels, but the lab will just use a “standard setting” unless instructed otherwise. So to get a more complete picture of the viable airborne spores in one space you may need to collect numerous petri-dish samples using different agars and to be incubated under different growing conditions. Some molds grow well under lab conditions, and others don’t. Some molds produce powerful chemical weapons used against neighboring colonies, which can influence the number of CFUs counted for both species. Microbial Volatile Organic Compound (MVOC) sampling. When molds are wet and have food they grow. When mold is “eating” it produces metabolic byproduct gases known as MVOCs. 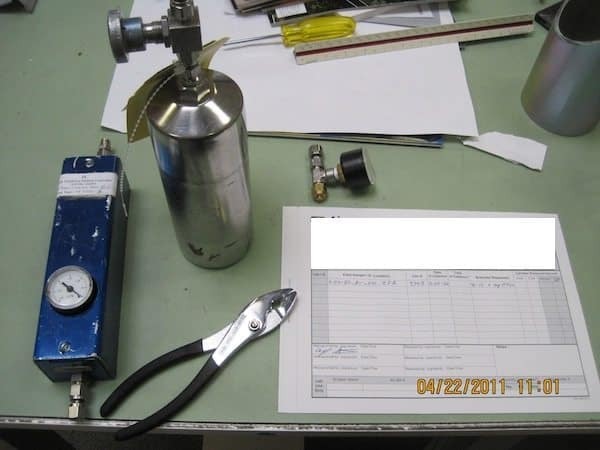 Air samples can either be collected in a summa canister or sorbent tube, and the lab analyzes the air sample for a limited set of microbial VOCs. MVOC indicator gases include but are not limited to the following: Furan, 1- and 2-Pentanol, 2-Hexanone, 2-Heptanone, 1- and 3-Octanol, and Geosmin. 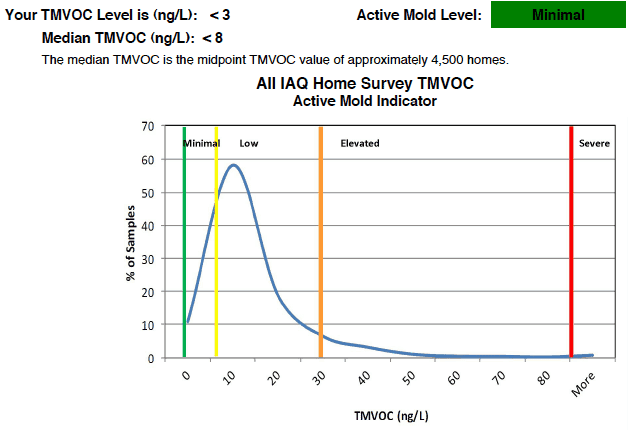 Most MVOC scans are limited in that they do not analyze for every possible MVOC, and most MVOCs have not been directly tied to a single species of mold so extrapolating from just MVOC data is rather limiting. If you smell “musty” odors you are probably inhaling MVOCs. It’s a sign of active microbial growth and can be tested via air sampling. Mycotoxin Testing. Mycotoxins are secondary metabolites produced by fungi. These are basically self-produced chemical weapons wich can harm other fungus, and can also cause disease and death in humans. Although the primary concern for humans is for ingestion, inhalation is also of concern. Few indoor environmental consultants are currently testing for mycotoxins. The three most commonly analyzed mycotoxins include aflatoxin, trichothecenes, and ochratoxin. The lab utilizes polymerase chain reaction (PRC) analysis to identify and quantify mycotoxins in air samples. Samples are collected in 37mm cassettes, preloaded with 0.45 um pore-sized filters, and sampling times are longer than typical sporetrap grab samples. Whereas the above referenced types of lab analysis rely on a lab technician’s ability to visually identify and count… PCR has over a 95% confidence rate and is more automated. Mold Testing – How to Interpret Lab Results and Air Quality Data? So you’ve had an inspection and received the lab results… what does it all mean? Companies that just send convoluted lab reports without further explanation should be put out of business. It is the role of the Certified Indoor Environmental Professional to help interpret the lab results in combination with what was gleaned from the visual inspection. Sporetrap lab results should include, at the VERY minimum, one outdoor sample and a handful of indoor samples. The outdoor sample is used as a control to compare to the indoor samples. Because there can be such variation in sporetrap samples the statistical significance from collecting so few samples is very limited. Most labs simply share a chart showing how many of which type of genera were present. Some labs offer their own “limited interpretation,” such as the MoldScore from EMLab P&K. “MoldSCORE™ is a specialized method for examining air sampling data. It is a score between 100 and 300, with 100 indicating a greater likelihood that the airborne indoor spores originated from the outside, and 300 indicating a greater likelihood that they originated from an inside source…” Below you can see some obvious “spikes” that EMLab identified as statistically significant higher counts of Cladosporium and Pen/Asp indoors compared to outdoors. Mycotoxin results may be paired with an individual’s blood test results, if they are working with an environmental doctor. We are often called in as a result of an environmental medicine practitioner finding that an individual’s body is reacting to mycotoxins… and then we have to find where that exposure is occurring – usually at home or work. The visible signs are enough to trigger some water damage restoration (IICRC S500) and most likely during that process some evidence of microbial growth will present itself and trigger professional mold remediation (IICRC S520). With all the visible damage you’ve specified it’s almost inevitable you’ll find some microbial growth – despite what a few mold tests may indicate. A mold inspector or industrial hygienist could introduce Stachy on their clothes, equipment, hair, etc. Without doing a lot of mold testing it’s hard to gain statistical relevance with just a few samples. In a home inspection to purchase a house, I received an air test result which showed evidence of Stachybotrys in several rooms and a control result outside with no evidence. Since this was a concern, the owner had another test completed by another company which did not show any evidence of Stachybotrys. He claims the first test was done wrong. What could an Inspector do, to produce evidence of Stachybotrys in an accident? Is that possible? There are signs all over the home of various structural damage inside and outside, moisture damage of paint staining and some bubbling on almost all corners of the rooms, some walls, and staining on ceiling too. but NO visible mold. But with a raised floor I can smell must coming from a gap in the floor where I’m convinced there must be mold under there. Air samples supposedly came back negative. Only air samples were taken and one directly from floor air, otherwise middle of room. Seemed to be five min each. Would you go further or should I rest easy with this result? Thanks. In general we can tell you very little about your building by only looking at mold lab results. What you really need is a thorough moisture and mold inspection. Any good industrial hygienist worth their salt will tell you to start with an inspection and not mold testing. It is common to get a false positive (or false negative) with testing. If there are significant species associated with water damage… and found in numerous samples indoors… than that would be a red flag. But it doesn’t mean you should jump to mold remediation. I suggest you find a local industrial hygiene company or mold expert to walk the property and review the lab results. Call us if you want to discuss further. You are wise to get a second opinion before diving into remediation if the scope of work remains illusive. I was wondering if I could get some help with my mold air sample test results. The company that did the test says we need mold redem. But we have no visible signs of mold or leaks? I could share my report, any help or advice is very much appreciated!! Look on Yelp. 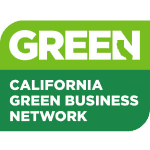 Or, if you are in Northern California looking for mold testing, call us at Healthy Building Science! Where or how can I get testing done for my home ?